Ask anyone who has ever tried Jeff’s Naturals and they will probably tell you there is something remarkably different about our olives, peppers, and other specialty items. What is it that sets us apart? Maybe it’s because we have close ties to our local growers in California and abroad in the Mediterranean which enables us to offer fresh ingredients reminiscent of what you would find in your own backyard garden. Perhaps it is our commitment to only using ingredients that are certified non-GMO, gluten free and vegan. Unlike many other companies, we do not add preservatives, additives, sulfites, artificial colors or flavors…..and you can taste the difference. Ask your store manager for a specific Jeff’s Naturals product you’ve been wanting to try- click here to see all of our products. Once the product appears on the shelf, take a photo and post it on our Facebook page before July 1, 2014. If you don’t use Facebook you can always send it to consumerinfo@jeffsnaturals.com . Please include the name of the store. In return, we will send you a special thank you gift….Everyone wins! There is something about our brand that makes it worthwhile to find us in your favorite natural foods store. Here are just a few examples of some people who have tried us and agree! We are asking for your help! Please spread the word about the “Bring Jeff’s Naturals to Your Favorite Natural Foods Store Challenge”! Since May is International Mediterranean Diet Month AND National Salad Month, we wanted to share some of our favorite salad recipes you can create using our all natural line of olives, peppers and more! A traditional Mediterranean diet is heart healthy and budget friendly. It consists of large quantities of fresh fruits and vegetables, nuts, fish, whole grains, legumes, olive oil, less red meat and dairy and no processed foods, refined sugars and flour. These salads are Mediterranean classics with a modern twist. You will find these recipes to be simple yet versatile enough to be used as a side dish and hearty enough to be the main course. Hope you enjoy! Thread shrimp onto metal skewers (or wooden skewers soaked in boiling water for 15 minutes). Brush both sides of the shrimp with 1/4 cup olive oil and sprinkle with the 1/2 tsp. salt and pepper. Heat gas grill, with all burners on high, until fully preheated, 10 to 15 minutes. Brush rack lightly with oil. Grill shrimp until cooked through, about 2 minutes per side. Meanwhile, in a medium bowl mix the crushed garlic, sugar, salt, oregano and balsamic vinegar. Slowly whisk in the 1/2 cup of olive oil. 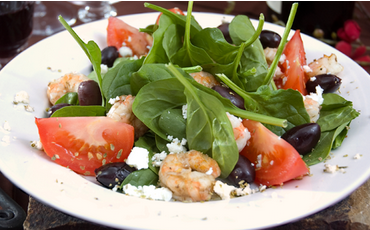 In a large serving bowl, combine the spinach, tomatoes, cheese, olives, and shrimp. Lightly toss the salad with the dressing. Top with fresh ground pepper and serve. Combine dressing ingredients in a small bowl and whisk briskly to combine and blend. Set aside. Place greens, red onion and basil in large shallow bowl (like a pasta bowl). Gently toss to mix. Scatter olives over the greens. Arrange tomatoes on the outer perimeter of the bowl. Scatter cheese over the center of the salad. Re-whisk the vinaigrette and drizzle over the salad and serve immediately. In a large mixing bowl add all ingredients and gently mix. Season with salt and pepper to taste. Chill for 5 to 10 minutes before serving. Served chilled. Combine all of the ingredients together in a stainless or non-reactive bowl, and toss together. Allow to marinate 15 minutes. Toss again before serving. Serve on nicely arranged lettuce leaves.